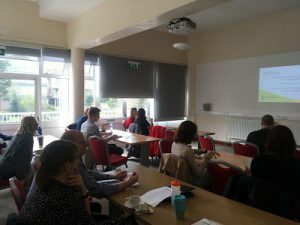 Home › TeachMeet › Aber LibTeachMeet 2018 – How can we make the library more inclusive? Aber LibTeachMeet 2018 – How can we make the library more inclusive? Aberystwyth University is well known for providing one of the best student experiences in the UK and a large part of that is down to the strong sense of belonging that we foster, not only with students and staff but with the wider community too. 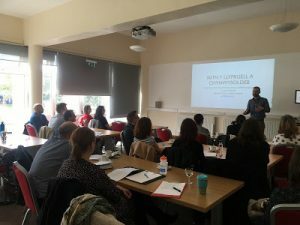 This year’s Aber LibTeachMeet focusing on inclusivity was a great opportunity to examine what it is we are currently doing so well but also to explore what else we can do both as individuals and as an institution to more actively meet the diverse needs of our users and to make the library as inclusive as possible to everyone. 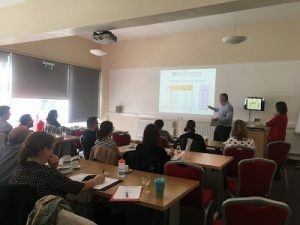 We prepared ten presentations exploring various elements of inclusivity – accommodating the needs of international or bilingual students, supporting those with sight impairments or those who stammer or building inclusivity by encouraging students to read. The event itself reflected the topic discussed. Speakers came from four different institutions – Aberystwyth University, University of Leicester, Sheffield Hallam University and Swansea University. Also, three different departments from within Aberystwyth University were represented – the International Student Centre, Student Support, and Information Services. The atmosphere was informal and kind, we openly discussed ideas, asked questions and expressed appreciation for shared experiences. The day started with a subject librarian, Lloyd Roderick, who gave a presentation on his experience of teaching information literacy bilingually. He shared a few useful resources such as Esboniadur and Gwerddon for helping to support students studying in the Welsh language. Lloyd’s talk was followed by Yvonne Rinkart from the International Student Centre who presented the findings of a short study exploring international foundation students’ library usage. One of the points raised by Yvonne was that international students are more susceptible to ‘library anxiety’ – the feeling of being confused and overwhelmed that libraries can sometimes induce. The next presentation given by John Harrington and Diane Jones, speakers from the Student Support Centre, gave us a good overview of the disability services they provide along with statistics for Aberystwyth University, and explained what inclusion really means. We had the opportunity to look at inclusivity from the student perspective too. A recent AU graduate, Cerys Davies, talked about her experience of using library services as a student with sight impairments. The talk inspired a wave of positive comments and questions. Among many other valuable points, Cerys talked about the difficulty she faced in obtaining accessible reading materials. Our first external speakers of the day were Harinder Matharu and Adam Smith who had joined us from the University of Leicester. They gave us an overview of the two initiatives contributing to their inclusive university environment – Read at Leicester and Unearthing Histories. Deepening the sense of belonging of minority groups by exploring their history in university’s archives was a truly inspiring idea. 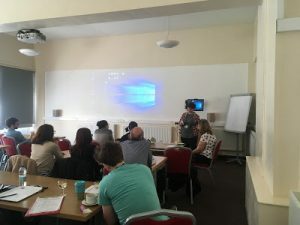 One of the IT Helpdesk crew members – Alice Farnworth talked about the benefits of embedding DSA software training within our library service. She presented us with a variety of assistive tools, of which some such as Read&Write or Inspiration are available on public computers at Aber. Next up, Philippa Price, who has been shortlisted for the Welsh Librarian of the year Award, told us about the Inclusive Services Group set up at Swansea University. Philippa talked about a broad range of initiatives the Group is organizing and promoting, such as creating recommended reading lists for the LGBT community or putting together dignity packs for homeless women. Hannah Dee, a lecturer from the Computer Science Department talked us through the idea of improving students’ writing and the ability to read by setting up a science-fiction book club for students and staff from her department. Hannah also introduced us to some interesting books, for which we are very grateful. Another visiting speaker, Paul Conway from Sheffield Hallam University, discussed accessible templates for presentations and hand-outs and other tips on being inclusive in the classroom. Kate Wright from the Aberystwyth University E-Learning Group delivered a short presentation on supporting users with a stammer. Kate raised a few interesting points including stammering not being perceived as disability, although it is classified as one. She also discussed the stereotypes surrounding stammering. As with our last three LibTeachMeets this was a fantastic forum for not only reflecting on current practice but for generating the new ideas necessary for us to continue to build on our reputation for inclusivity in a diverse and fast-changing environment. We received positive feedback from speakers and attendees who described the programme as interesting, varied, informative and thought-provoking. We greatly appreciate all who joined in and we hope it will generate some great ideas that will assist in our aim of increasing the awareness and accessibility of both the library facilities and the services on offer here.